Academie Duello’s vibrant youth program brings history to life through the martial arts of knights and musketeers! Children ages 8-14* can join us for our regularly scheduled youth classes and our seasonal Knight Camps. Youth 14+ are eligible to join our Adult Programs. Please check our Schedule for the class times. *Although our ongoing programs start at 8 years old, children of all ages can learn the basics of swordplay in one of our birthday party packages or in private lessons. When you arrive for a class, you are greeted by the Academie Duello Front Desk team. Our front desk staff are able to answer all of your questions about the school, our programs, and our instructors. All of Academie Duello’s youth classes involve a mix of academic learning and weapons based training. Classes start with a discussion on the months topic (armour, heraldry, etc. ), followed by a fun group warm-up. Students then study unarmed material to encourage good posture, structure, and movement, before concluding the lesson with solo and pairs exercises and games. When head contact is a possibility, we wear protective masks, and when things speed up we swap metal swords for plastic ones. After class the instructor is always available for questions, whether it’s about class content, other programs at Academie Duello, or general questions about the context of the arts we teach. If you have any questions on your way out, or if you want to sign up for more classes, you can also check in with the front desk. We sell most of the equipment listed above in our arms and armour store, including fencing masks and both plastic and steel swords. Feel free to ask the front desk staff or your child’s instructor about getting your own kit. A set of comfortable clothes suitable for doing exercise. A simple pair of thin cloth or leather gloves as well as groin protection is optional. If your child has any specific physical limitations, heath concerns, or injuries, be sure to let our staff know so we can appropriately adapt the program to their needs. Not ready to dive into our ongoing youth programs? 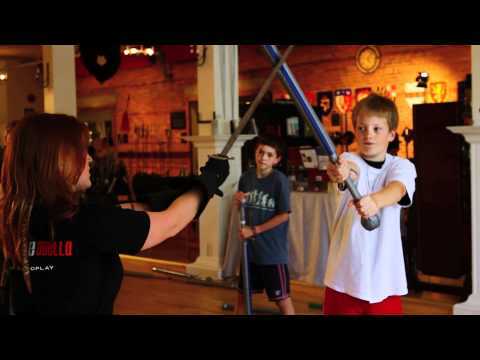 Try our Taste of Youth Swordplay lessons for an epic one time introduction! Schedule classes are 60 minutes long. We teach in a supportive environment where respect and accomplishment are encouraged. The ongoing classes focus on training the martial skills of medieval and renaissance Europe, including the use of the rapier, sidesword, longsword, and polearms. Over the course of a three-month cycle, youth classes focus on two of the main weapons so that students have time to gain a solid grasp of the foundation skills and mechanics of each weapon. Cycles run September-November, December-February, and March-May. From June through August, we cycle the topics monthly. How does my child advance in rankings? At the end of each month we run the students through a skills assessment that helps the children see how much they have learned, and guides the instructors to structure the next month’s content. Assessments are divided by subject, and students who assess for an entire set of skills are moved up to the next level of instruction. Additional assessments can be booked during Youth Free Sparring (1st, 3rd, and 5th Friday of the month), or before the day’s youth classes begin by talking with the instructor. How far can they advance? With focus and determination, it’s possible for youth students to master all of the skills of an adult student! This is, however, a process that takes years, and most students age out of the youth classes before they attain the higher ranks of the youth program. Even though the youth program ranks do not directly match up to the adult ranks, the skills do transfer over into the adult program. Students who gained ranks in the youth program can expect to advance at an accelerated pace in the adult program. All of the youth instructors at Academie Duello receive in-house training specific to historical European martial arts. Most of them also come with years of previous experience with youth-specific instruction, whether in children’s day camps, other martial arts instruction, or early childhood education. Aaron Lamontagne is the Head Youth Instructor. Do you compete against other martial arts groups? Adult students at Academie Duello can compete in inter-school and open competitions around the world, but youth students focus on honing their skills in-house. Each month we do offer 2-3 opportunities for youth students to compete against each other at our Youth Free Sparring (1st, 3rd, and 5th Friday of every month).